Today's cosmological models must account for a wealth of high precision observations covering an unprecedentedly wide wavelength range. 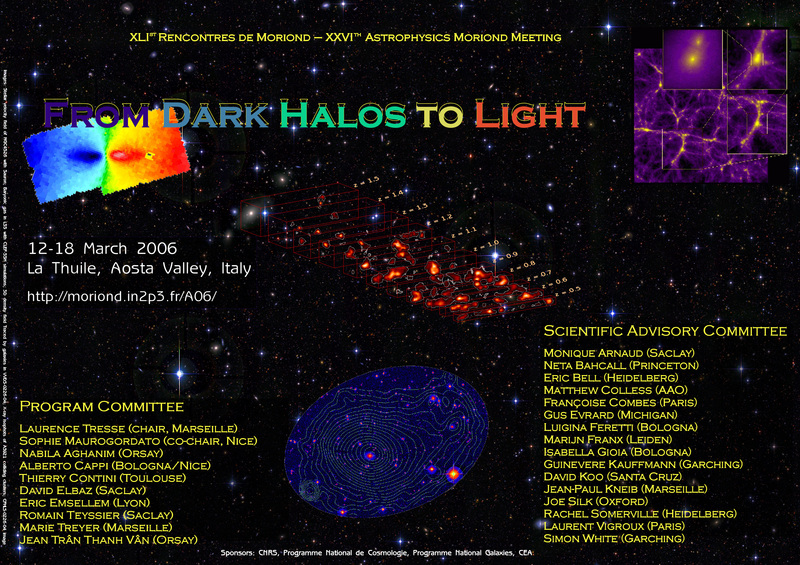 This Rencontre de Moriond is proposing to focus on the relations between the properties of observed structures (galaxies and clusters) and the underlying dark halo distribution. How did stars, gas and dark matter assemble and what are the general properties of these components? How is the interplay between the history of specific star formation rate and the mass halo assembly? How well can we constrain the mass of structures and how can this mass be used in a cosmological context? Scientists with interests covering theory, numerical simulations, and observations will be invited to confront their views on the subject. La Thuile is a pleasant winter sports resort located in the Italian Alps, 1450 m alt., about 120 km away from Geneva. The deadline for abstract submission is 15 January 2006. The deadline for registration is 15 February 2006.